3:41 p.m., Oct. 16, 2006--More than 120 family members, friends, University of Delaware faculty and staff, UD retirees and Newark residents gathered to pay tribute to the late John Munroe, one of Delaware's best-known historians and a member of the UD faculty for more than 60 years, during a celebration of his life on Sunday, Oct. 15, in Puglisi Orchestra Hall, in UD's new Center for the Arts. Dr. Munroe died Sept. 6. He was 92. The highlights of the celebration, which included musical interludes by the UD String Quartet, were reflections from two of Dr. Munroe's children, Stephen Munroe and Carol Munroe, and remarks by Damie Stillman, his friend of 52 years; William Williams, his former student and long-time friend; Richard McCormick, his nephew; Carol Hoffecker, Richards Professor Emerita of History; and a note of thanks from Dr. Munroe's widow, Dorothy. “He was a happy man who never doubted he had chosen the best program for his life's work,” Dorothy Munroe said. UD President David P. Roselle said Munroe was “a man who perfectly embodied the popular phrase, 'a gentleman and a scholar,'” and that it was no accident that he had received many distinguished awards from the University. “John left behind a legacy that extends far beyond the University of Delaware and, indeed, far beyond Delaware,” Roselle said. A native of Wilmington, Dr. Munroe earned his bachelor's and master's degrees from UD in 1936 and 1941, respectively, and he received his doctorate from the University of Pennsylvania in 1947. After teaching at Newark High School, he joined the UD faculty in 1942 as an instructor in history. He was named an assistant professor in 1947, an associate professor in 1949 and professor in 1952. In 1962, he was named H. Rodney Sharp Professor of History. As the primary instructor for the formerly required Delaware history course, Dr. Munroe taught a majority of the University's students for many years. He also served as assistant dean of the College of Arts and Sciences from 1949-51 and as chairperson of the Department of History from 1952-69. 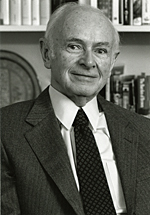 He retired in 1982 and was named H. Rodney Sharp Professor Emeritus of History. He was the author of more than 70 articles and several books, including Delaware Becomes a State (1953), Federalist Delaware (1954), Delaware: A Students' Guide to Localized History (1965), Louis McLane: Federalist and Jacksonian (1974), Colonial Delaware: A History (1978), History of Delaware (1979) and The University of Delaware: A History (1986). He was the coauthor, with Carol E. Hoffecker, of Books, Bricks and Bibliophiles: The University of Delaware Library (1984). He also edited Timoleon's Biographical History of Dionysius, Tyrant of Delaware (1958). Dr. Munroe was a regular contributor of articles about Delaware's history and government to encyclopedias and annuals, and from 1959-65, he had a regular column in the Wilmington Morning News. Special honors from the University included the Outstanding Alumnus Award in 1963, the Medal of Distinction in 1980 and the Francis Alison Award, the University's top honor to its faculty, in 1981. The citation for the Alison Award saluted Dr. Munroe's scholarship and service and noted, "The number of distinguished professionals that are among your former undergraduate and graduate students is the highest tribute to your role as an educator." In 1997, the University named Munroe Hall in his honor. Munroe Hall is the home of the Departments of Anthropology and History. Dr. Munroe donated his papers to the University of Delaware Library. He is survived by his wife, Dorothy, and children, Stephen, Carol and J. Michael.